Following a “One Thing in Common” show and last week’s special Bob Effros birthday show, we’re back with a regular ol’ edition of Rapidly Rotating Records. But of course that doesn’t mean that it isn’t fabulous, because it is! We’re going to stop and smell the flowers (wild flowers, that is), visit the cotton fields, find out what little girls and little boys are made of, and take a musical trip to the circus. 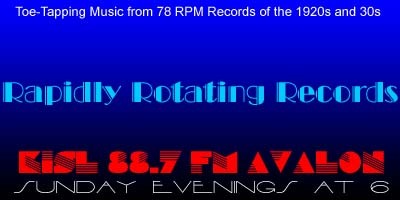 As usual, there are at least a couple of records making their RRR debut. If you enjoy the show, please let us know by leaving a comment on the website or the Facebook page or sending an email. And remember, your requests and topic segments are always welcome. As always, just click on the link below to instantly listen streaming online and/or download the show. Lovely One – Horace Heidt and His Brigadiers / Larry Cotton, v.
Pickin’ Cotton – George Olsen and His Music / Fran Frey, v.
Sugar – Eddie Thomas’ Collegians (Ben Selvin) / Frank Harris (Irving Kaufman), v.
Salty Dog – Freddie Keppard’s Jazz Cardinals / Charlie Jackson, v.
Don’t Drop A Slug In A Slot – Kay Kyser AHO / Isch-Ka-Bibble, Harry Babbit, Jinny Simms, v.
Who Tied A Can On The Old Dog’s Tail? – Columbians Dance Orchestra DeLuxe / Irving Kaufman, v.